Safe, Inc. has been awarded a Phase I SBIR program to develop and demonstrate a hands-free, automatic coupling restraint system that would eliminate the need for the Soldier to manually connect (to), activate, disconnect (from), and de-activate the vehicle restraint system. The leading cause of injuries and fatalities in military ground vehicles can be attributed to troops not wearing seat belts during accidents, and not from combat, as would be expected. This new restraint system would significantly decrease the number of injuries and fatalities occurring among unrestrained troops. This Phase I SBIR program will develop a replacement seating system coupled with a device to more safely and easily move cargo and personnel along the length of the US Navy C-2 Greyhound aircraft. This system is anticipated to reduce the turnaround time for carrier on-board delivery aircraft. The seating system will focus on reducing installation and removal time, reducing stowed volume and weight, and reducing the occurrence of injury to handling personnel. Safe’s goal is to develop concepts that can be utilized in the aircraft without requiring aircraft modification. Safe, Inc. has been awarded a Phase I SBIR contract to develop a physical shield to protect spherical bearings from abrasive particulates, such as sand and dirt. The shield will prevent much of the contamination damage that shortens bearing life on rotorcraft. The initial effort by Safe will be to design a shield that will minimize heat build-up, reduce maintenance costs in both labor time and materiel, reduce operation costs and time lost by increasing the lifespan and dependability of critical aircraft systems. The ultimate goal of this program is to develop a shield that will minimize the impact on assembly weight, on the flexural resistance, and on the overall bulk of the assembly. Safe has received an extension of an existing contract from the Aviation Applied Technology Directorate (AATD), Fort Eustis, Virginia. The contract is part of a Multi-phase Two Step BAA contracting vehicle to support the development of improved crash protection for crews of Army helicopters. The additional work will expand on the capability of the crash responsive technology developed by Safe in the previous phase of work. The goal is to extend the capability of current energy absorbing and restraint systems to provide crash protection in significantly more severe crashes than do current systems. The work involves modeling, analysis, design, and testing to be conducted over an 18-month time period. Safe is teamed with AmSafe Aviation of Phoenix, AZ to provide inflatable restraint support to the program. This Phase I SBIR program will develop an anthropomorphic test device (ATD) (also referred to as a “test manikin” or “test dummy”), which will be used specifically for land vehicle blast testing. The Hybrid III ATD was developed specifically for automobile crash testing and to quantify the types of injuries most commonly experienced in automobile crashes. The human response to blast insult is quite different, and consequently, the automotive ATDs lack biofidelity when exposed to a blast environment. 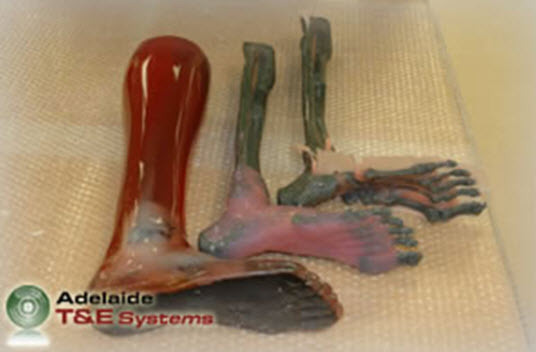 The initial effort will apply technology developed by Adelaide Test & Evaluation Systems for a Frangible Surrogate Leg to the upper leg, pelvis, and spine for a Combat Injury Manikin (CIMan). Safe’s ultimate goal is to develop an ATD that is biofidelic, yet affordable to use in blast testing. NAVSEA has awarded Safe a contract modification to fabricate a full-scale prototype of the VULCAN (shock and vibration resistant stowage system) and to continue the Phase II SBIR development effort. Safe is engineering the VULCAN, a reconfigurable common cradle pallet assembly for use on the Littoral Combat Ship, to securely stow and transport the ship’s mission-specific watercraft. Safe, Inc. has been awarded a Phase II SBIR contract to continue the development of a lightweight crashworthy troop seat for use in all Navy helicopters. The 18-month project will produce a qualified seat, common to multiple aircraft, with advanced crash protection and troop accommodation features. Safe, Inc. has been awarded a Phase II SBIR contract to continue the development of a hypoxia monitoring and warning system for use by pilots of high altitude/high-performance aircraft.